Imran Khan raised his hands, he had done it, Pakistan had done it. Imran Khan said this about his team two weeks before Pakistan lifted the World Cup at the Melbourne Cricket Ground (MCG) in 1992. If the 1992 World Cup taught Pakistanis anything it was this: miracles do happen, prayers do pay off, and belief does move mountains. Asked years later, Imran maintained that he believed he would win the World Cup even then; in fact he claims he was sure of it. Some called him delusional; others thought he had completely lost the plot – understandable when you consider the manner in which Pakistan reached the semi-final stage. Pakistan had lost to West Indies and beaten minnows, Zimbabwe, before the match against England. Batting first, Pakistan was dismissed for 74 and all seemed lost. 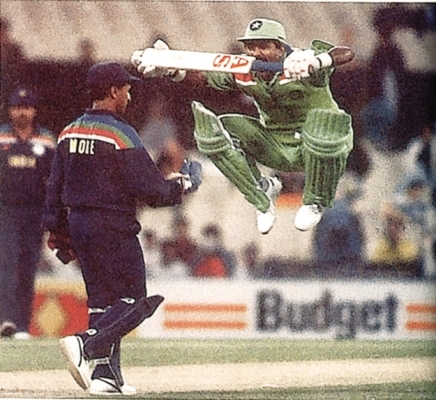 However, Pakistan did manage to get a point from this match; this one point changed the entire course of that World Cup. No, a Pakistani bowler didn’t demolish the English batting; instead the heavens opened and it rained at the Adelaide oval with England motoring along at 24 for one. The match was called off and both teams had to share the spoils. At the end of the round-robin stage, this one point lifted Pakistan above Australia and secured the passage into the semi-finals. Even after the England match, it wasn’t as if Pakistan coasted past the opposition. The team went on to lose the next two matches against India and South Africa respectively. At this point Pakistan had only won one out of its opening five fixtures and to win the Cup from there on, they had to win every single match plus hope for results elsewhere to go their way. Next up was the host nation, defending champions and tournament favourites, Australia. Pakistan typically had two relatively unknown stars at the time, shining through. Amir Sohail starred with the bat, scoring 76, while Aaqib Javed was the scourge of Australia with a ball in hand. Aaqib took three wickets for 21 runs in eight overs. Pakistan had beaten the hosts and that too at the mythical Wacca. Yes, it was the Perth wicket, the bounciest track in the world, a pitch on which Pakistani batsmen aren’t supposed to be good, a track which has buried many a subcontinent batsmen. So the win was nothing short of a miracle; this was perhaps the turning point, perhaps the catalyst some of the young players needed to ‘believe’. Sri Lanka was the next opponent, which was not much of a hurdle in those days. Sri Lanka managed to post 212 for six wickets in their 50 overs. Pakistan had to work hard to chase down the target in the last over with five balls and four wickets remaining. Javed Miandad anchored the run chase with a well-made 57. Pakistan now had to take on an unbeaten New Zealand at Christchurch. Cometh the hour cometh the man, Wasim Akram inspired Pakistan. The black caps were dismissed for 166, thanks to a four wicket haul from Wasim. Pakistan managed to chase the total down at a canter, Ramiz Raja stood up with the bat scoring of an impressive 119. Pakistan won with more than five overs to spare and seven wickets in hand. Despite this win, Pakistan’s destiny was not in its own hand. For Pakistan to qualify for the semi-final, Australia had to beat the mighty West Indies and the hosts obliged. Pakistan had reached the semi-finals somehow after being down and almost out. 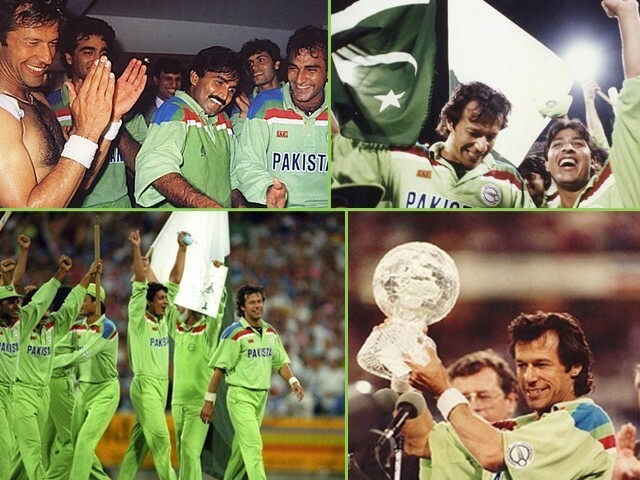 The term “cornered tigers” came into being and the greens now were only two wins away from winning the World Cup title. Auckland was the venue; Pakistan had to yet again defeat the confident New Zealanders in their own backyard. Remember that at this point Pakistan carried the “chockers” tag; this was the fourth consecutive semi-final for Imran’s men and they had lost all the previous three. The black caps batted first, Aaqib Javed and Mushtaq Ahmed gave Pakistan a good start. With New Zealand at 87 for three, in walked Rutherford who joined the audacious Martin Crowe to build a partnership of over a 100. But Rutherford was dismissed by Pakistan’s x factor, Wasim. Crowe was run out for 91 of 83 deliveries. New Zealand reached a formidable total of 262. The black caps would have felt very confident going into the dressing room, as Pakistan’s batting hadn’t quite clicked in the whole tournament and for them to chase the total down, some of the young players had to join the party. What happened then wasn’t a young boy just joining the party; this young man completely stole the show. The world witnessed an Inzamamul Haq massacre at Auckland. Pakistan’s mercurial talent scored a swashbuckling 60 of only 37 balls; he repaid the confidence and unwavering faith that Imran showed in him. One must not forget Javed Miandad’s 57, as he guided Inzamam through, while Imran came in at number three scoring 44 of 93 deliveries. 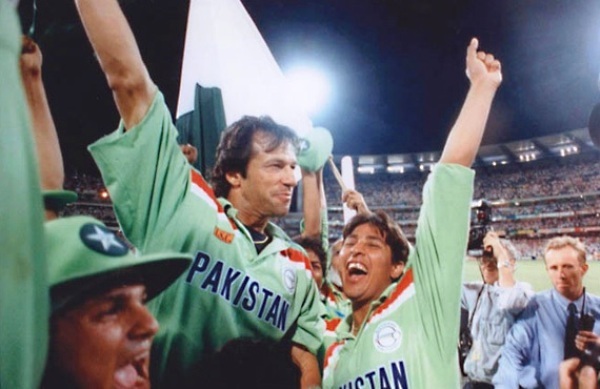 Pakistan had crossed the line, Javed and Imran had finally won a semi-final, they finally had reached the one match that eluded them throughout their illustrious careers, the World Cup final. 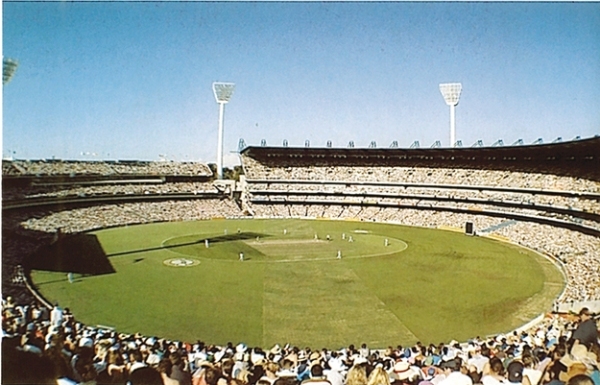 More than 87,000 people at the MCG witnessed the final match played between Pakistan and, its once colonial masters, England. 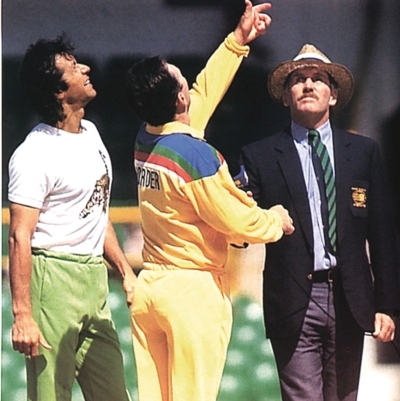 The nerves were obvious at the toss, Imran’s fidgety hand movements showed that even the greatest and the most experienced felt the excitement. He wore a T-shirt saying ‘cornered tiger’, the slogan summed up Pakistan’s passage into the final. 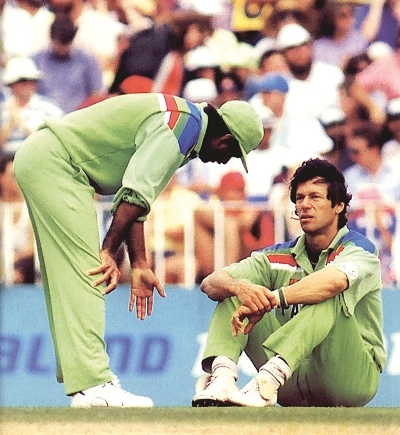 The two survivors from the 1975 World Cup were at the crease, Javed Miandad and Imran Khan. Around 17 years of ‘nearly there’, four World Cups of agony and despair, this was their swan song. 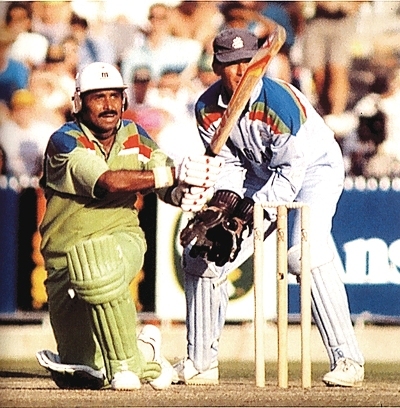 If anyone ever dropped a World Cup it was Graham Gooch, who dropped Imran at nine. Imran went on to score a very vital 72. Miandad made yet another gritty fifty. The two laid down the platform for the likes of Inzamam and Wasim to go hell for leather in the final overs. The two duly obliged, Wasim scored a blistering 33 of 18 balls while Inzamam carried on from his semi-final performance scoring 42 of 35. Pakistan managed to reach a competitive total of 249 runs. England started off their run chase in the most unwanted manner. Wasim and Aaqib provided Pakistan with early wickets. Wasim bowled a superb delivery to dismiss the great Ian Botham, who to this day maintains he never edged the ball. At one stage, England were 69 for four before the ODI specialists Allan Lamb and Neil Fairbrother came to the crease together. The two went on their merry way and it seemed as if England would find a way back into the match. From 69 for four, England had reached to 140 for four. Imran was forced into bringing Wasim back. Then came that one over, those two deliveries that changed the course of Pakistan cricket forever. Lamb was clean bowled with an indescribable ball; Wasim angled the ball onto him from around the wicket and it crashed into Lamb’s off stump. But Wasim wasn’t done with his magic; on the very next delivery he bowled another ripper, the ball swung in this time and Lewis was bowled for a golden duck. Fairbrother, the lone man fighting, was dismissed soon after by Aaqib. 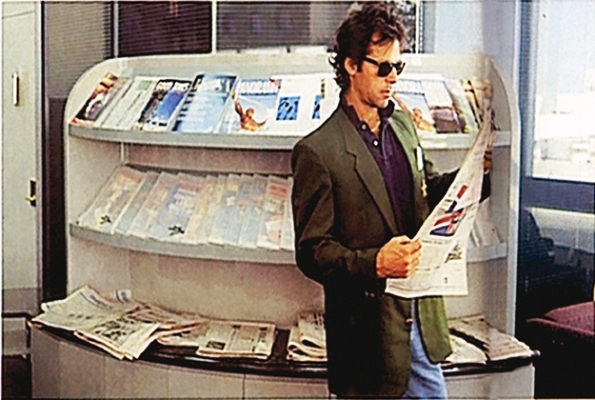 Fittingly, it was the great Imran who took the last wicket. It was as if a script had been written in the heavens for Pakistan’s favourite cricket son. Richard Illingworth skied the ball and it was caught by Rameez Raja. Imran Khan raised his hands; he had done it, Pakistan had done it. The cherry on top was that the former colonial masters had been defeated and the once ruled became the rulers. 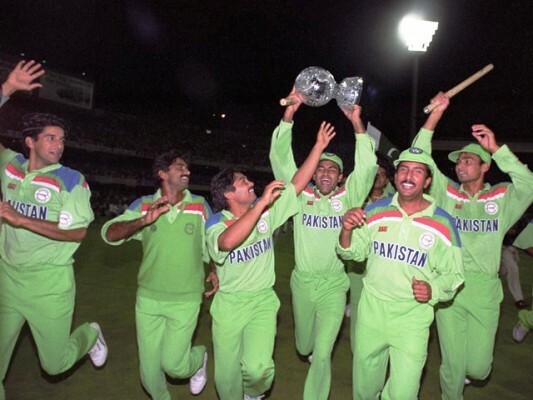 The 1992 World Cup forever changed Pakistan cricket, One Day cricket was already popular but it became even more so after this win. It changed the lives of all those involved. Wasim Akram forever became Wasim Bhai, Imran Khan became ‘immortal’, Inzamam became ‘Inzi-maaaaam’ and Javaid became the ‘saviour’. The holy month of Ramazan was being celebrated in Pakistan; the prayers of millions were answered. It was truly a miracle; no team had ever won a World Cup after only winning one of the opening five fixtures but the cornered tigers did so. This pretty much became the DNA of the Pakistan team from then on. You heard things like ‘the most unpredictable team’, ‘never count them out’, ‘on their day they can beat anyone’ and Pakistan remained true to this reputation. Whenever the team was in the doldrums and when no one gave Pakistan a chance, they struck like cornered tigers. 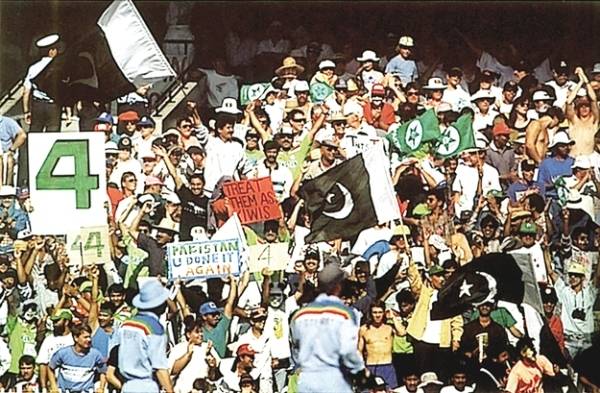 Imran’s belief, Inzamamul’s audacity, Wasim’s skill, Javed’s grittiness, and Aaqib and Mushtaq’s youthful exuberance will forever go down in cricket’s history books as the ingredients for the most unlikely triumph. It remains to be seen if this time Pakistan will have a similar luck. Can our team bring us the World Cup 2015? Only time will tell.